Taken under artificial light as the light outside has gone out due to early sunset...colour's pretty accurate though. The supplies in the background are just my attempts at making my own polish. 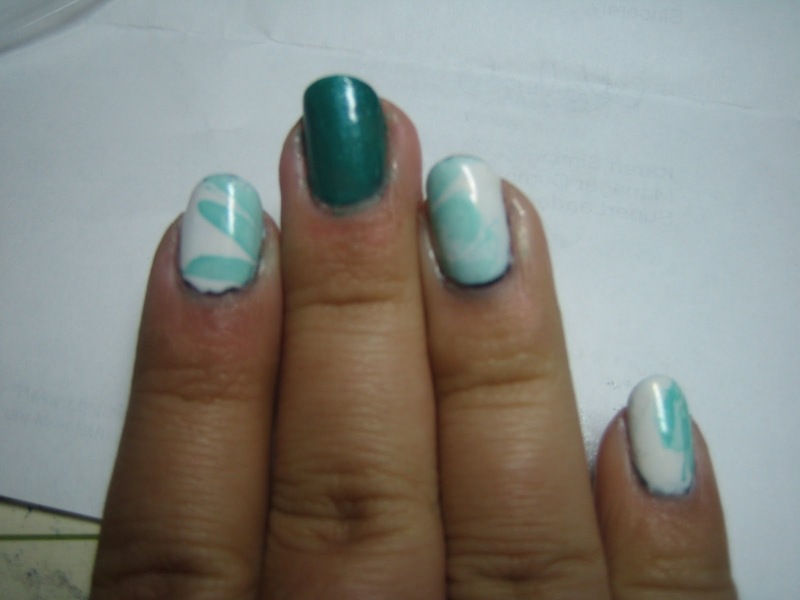 This is my attempt at water marbling with Ulta3 Pacific Fever, which is a really nice teal colour with a subtle gold shimmer which doesn't really come out on the nail. Or I just put too little coats on, one of the two. I still love it though, currently my favourite polish along with the OPI Turquoise Crackle. On the other hand (pun intended), we still have the crackle and the Cutex, which is doing nicely in its third day of wear. No tip wear or anything! 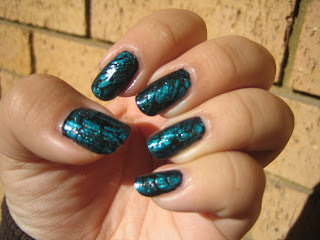 I don't think I ever mentioned that I tried different directions with the crackle polish! Thumb is vertical (if you hold your hand straight up), index is diagonally to the right, middle diagonally to the left, ring is a mix of the two, and pinky is vertical (bottom half) and horizontal (top half). Personally I like the diagonals the best. Stupid little girls screaming their heads off outside.